So today I'm going to show you. expensive, so let's go with the other method. This other method is gambling. luck, then... well, good luck with it! This method includes random scrolls. However, there still is a chance to get the one you actually want. or helmets, or maximum critical rate in gloves or suits. useless trying random in your boots. Well first of all an item with 2 slots. A slot extender matching the grade of that item. core alchemist in your favorite town, and last but not least. I totally didn't buy the cheapest items I could find in the shop. Master's Palladium Orb?... and my Slot Extender Highest? So a few things to know about filling the slots of an item. The first slot in armors and weapons is permanent once you succeed with filling it. The second slot is sort of variable. will be reset to be empty as well. to 10, and you can upgrade your item. Remember when I said your chances to get your expected option are quite low? Let's fill the first one with critical damage. This one is going to be permanent. It cannot be removed anymore. Now obviously, you're not likely to get it first. You see, I got something different too. And, let's fail it so that the second one will be reset too. doesn't have rate in it? If your answer is yes, put a critical damage scroll in it! if the results are unsatisfying. your chance to succeed is quite slim, and in this case that's good! You want to fail your 3rd slot, so that the 2nd option will be gone. 2nd slot, and then succeed when filling the 3rd one. That means all 3 slots will be filled, and there's no way to ever modify them again. You can decide to use your item, or throw it away. And you will have to buy a new item and a new slot extender to try again. The favorable outcome is to have critical rate in the 2nd slot. Now this is the part where you stop! You must NOT fill the 3rd slot just yet! So this is the part where you start upgrading. 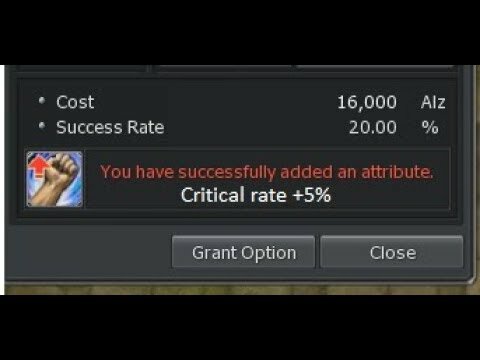 damage, AND using 10 force cores to have maximum chance for success. so expensive, well here's your answer.